In cases of isolated iliac or proximal common femoral artery occlusive disease, several options exist when patients present with symptoms of claudication or, less commonly, limb-threatening ischemia (eg, nonhealing ulcers or gangrene; see the images below). Additional indications include isolated iliac aneurysm and proximal common femoral aneurysm. 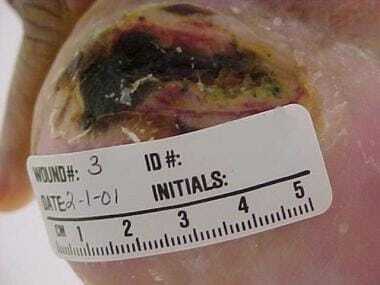 Pressure ulcer of the heel exacerbated by arterial occlusive disease. Cyanosis of the first toe and dependent rubor of the foot characteristic of arterial insufficiency. Peripheral interventions, including angioplasty and stenting,  remain the mainstay of treatment. However, when these measures are unsuccessful or inadvisable, operative treatment is indicated. Iliofemoral bypass may be considered in cases of isolated iliac or proximal common femoral artery occlusive disease, provided that the aorta and the proximal ipsilateral common iliac artery are free of severe occlusive disease. [2, 5] In addition, iliofemoral bypass is preferred in certain scenarios where femorofemoral bypass is contraindicated—for example, when the contralateral donor iliac artery may not provide adequate inflow because of proximal disease, or when there is heavy scarring or infection in the contralateral femoral region. The morbidity and mortality of iliofemoral bypass are low, provided that the patient is from a low-risk group. In one study, the patency rate for this procedure was approximately 96% at 1 year and 92% at 3 years. For the subgroup of patients whose operative indication was limb salvage (those with rest pain, ulcer, or gangrene), the salvage rate was 86% at 1 year and 76% at 3 years. A subsequent study of iliofemoral bypass in 40 patients with unilateral aortoiliac occlusive disease found that this procedure achieved excellent technical and functional outcomes, particularly in patients treated for vasculogenic claudication. Secondary patency was 97.5% at 1 year and 93.3% at 5 years. The limb salvage rate in patients with critical limb ischemia was 85.1% at 1 year and 79.1% at 5 years. Limb amputation was performed because of infection in two patients and because of failed iliofemoral bypass in two patients. Mehta M, Zhou Y, Paty PS, Teymouri M, Jafree K, Bakhtawar H, et al. Percutaneous common femoral artery interventions using angioplasty, atherectomy, and stenting. J Vasc Surg. 2016 Aug. 64 (2):369-379. [Medline]. Kalman PG, Hosang M, Johnston KW, Walker PM. Unilateral iliac disease: the role of iliofemoral bypass. J Vasc Surg. 1987 Aug. 6(2):139-43. [Medline]. Nazzal MMS. Iliofemoral bypass. Hoballah JJ, Scott-Conner CEH, Chong HS, eds. Operative Dictations in General and Vascular Surgery. 3rd ed. Cham, Switzerland: Springer; 2017. 719-20. Perler BA, Burdick JF, Williams GM. Femoro-femoral or ilio-femoral bypass for unilateral inflow reconstruction?. Am J Surg. 1991 Apr. 161(4):426-30. [Medline]. Ricco JB, Thanh Phong L, Belmonte R, Schneider F, Valagier A, Illuminati G, et al. Open surgery for chronic limb ischemia: a review. J Cardiovasc Surg (Torino). 2013 Dec. 54 (6):719-27. [Medline]. Aortoiliac disease. Rutherford RB, ed. Rutherford's Vascular Surgery. 6th ed. Philadelphia: WB Saunders; 2005. Carsten CG 3rd, Kalbaugh CA, Langan EM 3rd, Cass AL, Cull DL, Snyder BA, et al. Contemporary outcomes of iliofemoral bypass grafting for unilateral aortoiliac occlusive disease: a 10-year experience. Am Surg. 2008 Jun. 74(6):555-9; discussion 559-60. [Medline]. Ultee KH, Zettervall SL, Soden PA, Darling J, Siracuse JJ, Alef MJ, et al. The impact of concomitant procedures during endovascular abdominal aortic aneurysm repair on perioperative outcomes. J Vasc Surg. 2016 Jun. 63 (6):1411-1419.e2. [Medline].